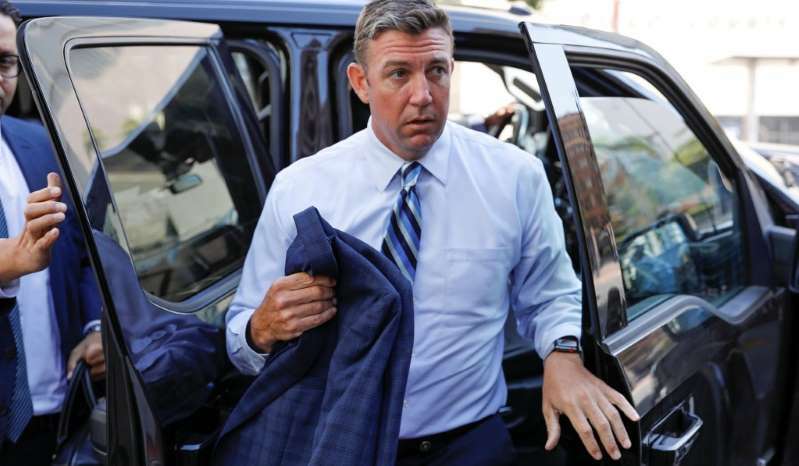 Congressman Duncan Hunter (R, Calif.) arrives for his arraignment at federal court in San Diego, Calif., August 23, 2018. Let’s stipulate right off the bat that the life of an elected official has a lot of challenges that aren’t immediately visible to constituents. You need to maintain residence in both the capital and your district. You’re away from your family a lot. Unless you’re independently wealthy, you’re constantly asking other people for money. You have to disclose a certain amount of your personal financial information. Not many people care if their local baker, banker, or barista is cheating on their spouse or going through a rough patch, but your marital problems are considered news fit for public scrutiny. You never know when some nut-job might threaten your life. Whatever position you take, you’re going to upset someone. Almost everyone you meet wants something from you. People will line up and wait for hours for the chance to yell at you at a town-hall meeting. Your own allies in the legislature are probably eager to stab you in the back or step on you if you stand in the way of their ambitions. And the odds are good that there’s a well-funded, well-organized opposition party that wants to destroy your reputation and take your job. Then there’s the news media. They ask a lot of questions about a wide variety of topics, and any time you admit you don’t know, you’ll be accused of intolerable ignorance. If you change your mind on a topic, you’ll be accused of flip-flopping. Defy the majority of public opinion on an issue and you’ll get called an arrogant ideologue; concur with the majority of public opinion and you’ll get dismissed as a mere weathervane. You’re likely to get blamed for just about every government failure, whether or not you had any control over it. Any less-than-coherent moment in public risks becoming a viral object of mockery. Your religious beliefs will come under scrutiny. How you choose to spend your money will come under scrutiny. If you’re a Republican, you’ll constantly be asked if you denounce any old idiot who happens to have the same party affiliation. If you lose your temper about any of this, you’ll be portrayed as a deranged lunatic. And yet, as enormous as those drawbacks are, the perks make the job worth it. First, of course, there’s the power of the office. When you speak, people listen. You can introduce, co-sponsor, and vote on legislation. You can hold officials accountable through hearings. A lot of offices in both the public and private sectors will return your phone calls quickly. You have a hand in directing billions in federal spending. At some point, you’ll probably even meet the president, although God knows whether he’ll actually listen to you. You say you want to make a comfortable living? Every member of the House earns, at minimum, $174,000 per year. If the member and his/her spouse have no other income, this puts them in the top 8 percent in the country. Members must abide by a few limits on outside employment, but not many. They get an office budget — currently somewhere in the $1.2 million to $1.38 million range — based upon their distance from their district (for travel expenses) and the number of people it contains. They can travel, at taxpayer expense, on “Codels” — Congressional Delegations — for official business. The post-politics career opportunities for those of them who keep their noses clean are plentiful and often lucrative, from lobbying or “consulting” for Washington law firms to serving on corporate boards to teaching at universities to writing books to becoming talking heads on television to taking appointed positions in government. In other words, if you find yourself lucky enough to be elected to Congress, you are probably set for life, unless you do something stupid and/or illegal, as Representative Duncan Hunter Jr. is alleged to have done. "The Hunters illegally used campaign funds, among other things, to purchase the following: Hotel rooms, airline tickets and upgrades, meals and food, and entertainment expenses for vacations for themselves and their friends and family, including more than $14,000 for a family Thanksgiving vacation in Italy in November 2015; more than $6,500 for a family vacation to Hawaii in April 2015; more than $3,700 for a family vacation to Las Vegas and Boise in July 2015; more than $2,400 for a Las Vegas couples vacation in August 2011; and more vacations to destinations such as Lake Tahoe, Pittsburgh, London, and Washington." "On or about October 22, 2014, in San Diego, California, Duncan Hunter spent $204.34 in campaign funds for two greens fees, food, and drinks at the Rancho Bernardo Golf Resort, during a personal golf outing with friends, including Individual 1A. To conceal and disguise his illegal activity, he misled his Chief of Staff by describing his regular golf outing with Individual 1A as ‘a Christian thing’ with a supporter." You’ve probably had an embarrassing notice from the bank that your check bounced, had your credit card declined, or endured other indicators that you’re trying to spend money that you don’t have. According to the indictment, the Hunters overdrew their bank account more than 1,100 times in a seven-year period. The congressman and his wife will have their day in court. Perhaps the jury won’t believe the charges or will accept some explanation from the defendants. But right now, the indictment seems like a sterling example of why members of Congress need to be subjected to such relentless scrutiny and constant skepticism. Yes, it probably feels unfair, but elected officials are given a pretty sweet deal — certainly a better arrangement than what most of their constituents will ever know — and some of them just can’t resist the urge to take even more.